When you have chosen to combine your shipment into an already Working Shipment, the items that you have added will still need box assignments for their Box Level Content. This is very easy to do! Simply go to the shipment that your items were added to and click the 3 horizontal lines. Select Box Content Information. You will see that you have your previously assigned items there, as well as your new items that still require an assignment. Click the dropdown next to Assign and choose the box to put the items in, and the quantity you’d like in that box. 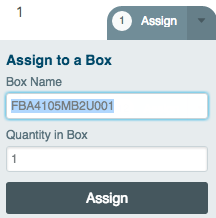 Repeat until all of the items in the shipment have been assigned.